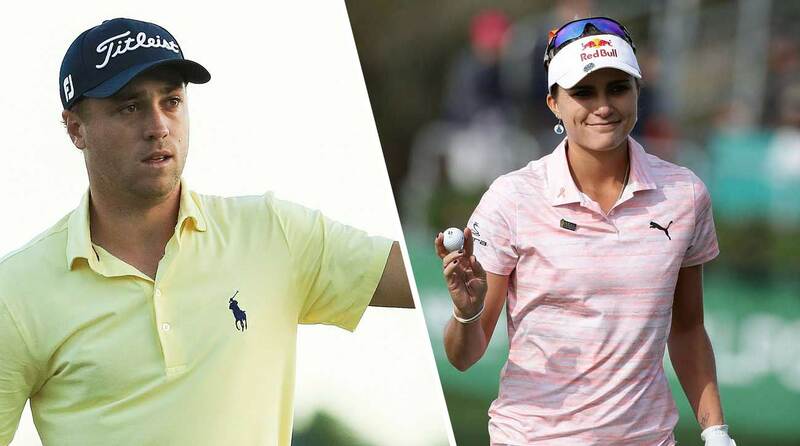 Justin Thomas and Lexi Thompson have been named to a list of the "Ten Best-Mannered People" from 2018. The list, published by the National League of Junior Cotillions (NLJC), was headlined by Drew Brees and included figures from across the sports and entertainment world. "The selections are made based on each person’s commitment to honor, dignity, and mannerly conduct,” said NLJC president Charles Winters in a statement. “We feel these ten individuals have distinguished themselves through excellence of character and conduct and applaud them for their contributions to society." Justin Thomas and Lexi Thompson were named to this year's Best-Mannered list. Justin Thomas earned his spot on the list "for consistently treating his fans and fellow golfers with respect and kindness," according to the NLJC. It was an eventful year for Thomas. Coming off a Player of the Year campaign in 2017, the 25-year-old lived up to elevated expectations with two more wins and 11 top-10s. "It's been a really consistent year, and I take a lot of pride in that," Thomas said at the Tour Championship. "Yeah, I would have liked to have more top 10s or more top 5s or more wins, but as a whole, I feel like I've gotten better as a player this year." The irony of Thomas's selection came from an incident at the Honda Classic where Thomas had an unruly fan removed from the event. The fan had yelled for Thomas's ball to "get in the bunker!" on a tee shot. "Enjoy your day buddy, you're gone," Thomas told him, pointing out the spectator to security. He went on to win the event, and expressed some regret at the incident. Thomas also expressed worry that golf's galleries were getting "out of hand." "I guess it’s a part of it now, unfortunately. I wish it wasn’t. I wish people didn’t think it was so amusing to yell and all that stuff while we’re trying to hit shots and play.” But Thomas's appreciation for fans showed up at the very same tournament. On Friday, he tossed a ball to a teenager in the gallery following along, and the gesture meant more than he'd realized: its recipient, Evan Kuperman, was a sophomore on the Marjorie Stoneman Douglas High School golf team and had been at school for a horrific shooting just two weeks before. GOLF's Michael Bamberger told him after the round how much the interaction had meant to Kuperman. "That’s incredible,” Thomas said. “It just makes you feel good to know you could do a little something that would mean something to another person. Thank you for sharing that." Lexi Thompson's recognition came "for demonstrating poise and professionalism in the spotlight," according to the NLJC. It was a rollercoaster year for Thompson. The 23-year-old superstar was involved in two more rules controversies, one in Thailand in February and another in August at the Indy Women in Tech Championship. She stepped away from the game for several weeks, skipping the Women’s British Open to “recharge [her] mental batteries.” In October, Thompson took to Instagram to discuss issues with her self image and body confidence. But Thompson capped the year off in style: With her brother on the bag, she captured her first victory of the season, a four-shot statement win at the CME Group Tour Championship. "It’s been a long year,” Thompson said after the win. "Just the up and downs and just the things I’ve been dealing with, they all kind of hit me this year. To be able to end the year like this and just keep on fighting throughout the whole year has meant the world to me. Just shows anything is possible. You have to fight through whatever you’re going through." In 2017, Rickie Fowler was atop the list, while Matt Kuchar joined him in the top 10.